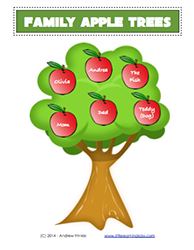 Make your family tree with apple trees! Cut out apples to put on the different tree designs in color of B&W. Write the names of your pets and family members on the apples and paste them on the trees. Ideas for further activities are included.